Reporting on tags is tricky in Insights. Tags do not function like other ticket properties, so it takes special steps to use them in reports. This tip will provide an overview of tag reporting in Insights and how to filter reports by tags. If you are looking for a more basic recipe for reporting on tags, see Reporting on ticket tags in our Support tech notes. Note: To measure the number of tickets solved by tags, you must use the # Solved Tickets metric. For more information on # Solved Tickets, see What is the difference between # Solved Tickets and # Tickets Solved? in our Support tech notes. Tags are in a unique, many-to-many relationship with tickets. One tag can be on multiple tickets, and one ticket can contain multiple tags simultaneously. This is different from all other ticket properties. For example, a ticket can only be in one group at a time, but it could have 200 tags. To manage that many-to-many relationship, tags are treated differently when they are imported into Insights. Instead of simply listing the tags associated with a ticket, a unique ID is created for each ticket/tag combination. This tag data is stored in its own dataset. This means ticket/tag data is completely separate from other ticket properties, even though they are all associated with ticket ID. This metric has no connection to ticket tag data. If you use this default metric in your report, it will ignore any filters based on ticket tags. If you want to report on tags consistently, you'll need to take a few extra steps (see Filtering reports by ticket tags). Before jumping in, ask yourself if there is an easier method to get the same result. For some tags and workflows, it might be more effective to use a custom field rather than a tag. For example, if you receive tickets from region 1, region 2, or region 3. One way to track this is to automatically add "region1," "region2," and "region3" tags when a ticket is created. That works well in Zendesk business rules, but it makes reporting more difficult. Since a ticket can only come from one region, you can create a custom drop-down field for it. You can then report on fields rather than tags. Reports using custom fields are easier to filter. You can just use the field attribute, instead of going through all the required steps to report on ticket tags. For more information see, Reporting on custom fields in Insights. As described before, tag data won't function in a report unless the metric connects to the tags dataset. The default # Tickets metric does this for tag inclusion, but to exclude tags from your report you will need to follow the steps outlined in this section. This section will instruct you on how to build these filters using a custom metric and a numeric range filter. For information on user and organization tags, see Reporting on user and organization tags in our support tech notes. The examples below will report on full resolution time for VIP tickets that have not merged. These are tickets that have a "vip" tag, but do not have the "closed_by_merge" tag. You can substitute in your own tags, as long as you follow the same basic formula. Note: These metrics use the Advanced Metric Editor. For more information, see Creating and using metrics on GoodData's support site. Substitute your_tag with your desired tag. This metric does two things. 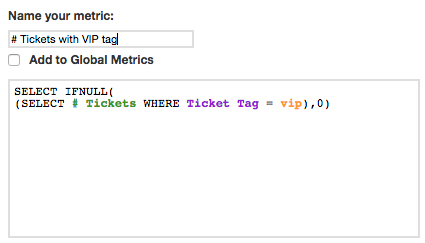 The inner part of the metric uses the default # Tickets metric to count all tickets with a certain tag. The outer part of the metric ("IFNULL ... 0") means that tickets without the tag are counted as 0 instead of null. If you want these custom metrics to be available for any report, check the Add to Global Metrics box. After you create your metrics, you can use them to filter your report. If you do not want to use numeric range filters to filter your report see, Adding tag filters within a custom metric. Under Select Attribute, select Ticket Id. Under Select Metric, select one of the custom metrics you created above. For the Range, set the drop-down to "is equal to." Enter a value of 1 or 0. If the metric is equal to 1, the report will only include tickets that have the tag. If the metric is equal to 0, the report will only include tickets that do not have the tag. For this example report, tickets should have the "vip" tag, so the numeric range filter for the "vip" metric is set to equal 1. 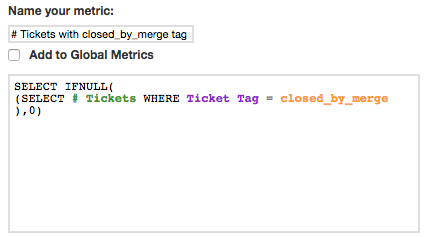 For this example, tickets should not have the "closed_by_merge" tag, so the numeric range filter for the "closed_by_merge" metric is set to equal 0. After you add your filters, you can remove the custom metrics from your report. As long as the report is looking at ticket data, the filters should keep working. This example is reporting on the full resolution time, using the default Full Resolution Time (min) [Mdn] metric under What. These numeric range filters will apply to the whole report, but that is not always ideal. 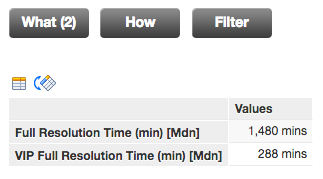 For example, you might want to compare the VIP resolution time above to the overall resolution time. With report-level filters, you can't see both numbers in the same report at the same time. This piece does the same thing as the numeric range filter, but it works within a larger metric. That way, you can filter each metric individually. Since the tag filters are built into the metric, the numeric range filters can be removed from the Filter panel of the report. This enables you to compare metrics with different filters. When it comes to reporting, ticket tags are certainly complex. They have their own spot in the data model with complicated architecture to maintain their unique relationships. Fortunately, the hard work is already done. After you create these metrics, you can apply them to any ticket-based report. Is it possible to apply this filtration at the level of a custom metric, rather than applying the filter to the whole report? I have several tags that I would like to compare on a single report, rather than creating a separate report for each tag. Essentially, I'm trying to find a way to slice # Replies [Avg] by a select number of tags. Replace "billing" with whatever tag you want to report on. I believe this should work but let me know if you run into any snags. How would I create a metric that only returns tickets that have two specific tags? I too am trying to avoid using filters for this. I haven't had the opportunity to QA this extensively but from my preliminary testing it appears to work. This is great! Can you track the time in (days or hours) from when the specific tag was added and report it? If not, what would be a work around? I am trying to create a report to see how long a ticket "sits" in a specific stage. Thanks! The "Events Dataset" is what allows you to report on when specific changes happened to a ticket, historically (as opposed to simply reporting on a ticket's present day state). Unfortunately, the Ticket Tags dataset is not connected to the Events dataset and therefore you cannot report on when a tag was added to or removed from a ticket. I just wanted to hop in here and let you know that we've revamped this article to include additional information and clarify some things. Be sure to give it a look! I am trying to create a metric to report on # of tickets with a specific tag. Hi Justin! It looks like you clicked "Add" on the lower right. That actually tries to add the metric to your report. It's the last button you should click, once everything else is complete. To add # Tickets (or any other element) to your report, you can double-click it in the list or click "Add Selected" on the top right. That should put the color-coded element in your metric and allow you to continue. @Amy - that worked! Thanks so much! I'm trying the same thing Sean mentioned earlier, creating a metric for tickets with two specific tags. I used the steps Joseph lists and I'm returning no results. Has anyone verified how to do this? Hi Travis! Those steps should work. We've also updated this article since those comments were posted. There are screenshots above showing very similar metric recipes. There are a lot of moving parts in a recipe like this. The results also depend on your account's data. I'm going to start up a ticket for you, so we can take a closer look at your report so far. Watch for my email, and happy reporting! I wondered whether you could help with something I'm really struggling with or even if you can tell me whether it's possible using Insights at all (we're on the Professional plan). I would like to be able to report on FRT (business hours) by tag. Some of our incoming tickets are auto-tagged with 'subscribed' upon entering Zendesk - ideally we'd like to see that these tickets are being answered more quickly than tickets without a tag (so the FRT would be lower). Logically I would have thought you'd be able to select the pre-made FRT (business hours) metric in the WHAT, select the time scale in the HOW and then FILTER by tag. However, this doesn't seem to work like that. I couldn't see to create what I'm after using the metrics already set up, so I built out some custom metrics. I did a controlled day where I responded to the tickets with the 'subscribed' tag in under an hour and responded to the tickets without a tag in over 2 hours. The results however were identical for each metric and seemed to draw on the FRT metric without the 'subscribed' tag. You can see this on the date of the 3.3.2017. Does anyone have any suggestions as to how I can get around this issue. It's creating a fairly large blockage in our work. If it's not possible at all in Insights, even that would be great to know so we can start exploring other methods and tools. Hi Sophie! Ticket tags are not like other attributes. You can have any number of tags on a ticket at the same time, and you may need to report on any one of them. To make that possible, tag data is stored in a separate dataset. This means you need to take special steps to use tags in a report. You need to use a metric that connects to the tag dataset, and you need to construct filters that work with that metric. The First reply time metrics do not have any connection to tag data on their own, so they will ignore all tag filters. The article above goes into the theory behind tag reporting, and it shows some examples of metrics that do and do not connect to tag data. It also includes a recipe section describing how to build tag filtering metrics. Go through the recipe section once again, and try to build the metrics from the example report. That should give you a better idea of how the pieces fit together, which should help you fine tune the results for your use case. Hi Linda! Tags are not like other attributes. For other attributes, tickets can only have one value at a time. It's easy to see whether a ticket is in, say, Pending status -- the ticket only has one status, and it either is or isn't "Pending." Tags are different. Tickets can have any number of tags at the same time. That makes things quite a bit more complicated. A ticket may have one of the tags from your filter, but not another. There are lot of ways to handle those situations, and Insights doesn't know which one you need. Because of all this, ticket tags do not consistently work in a dashboard filter like the one in your screenshot. Every single report would need to have metrics that accurately connect to tag data, and even then, there would be a lot of exceptions. We do not recommend putting a tag filter on a dashboard. If you want to use tags, you must use custom tag filtering metrics within your reports. Please follow the recipe above to filter your reports. Hi Everyone, I am trying to create a metric to be able to report on tags. I have followed the above steps however when I go to add 'your_tag' in some of the Tags aren't there, I created them earlier today and can select them in tickets. Hi Charlee-Louise! Have you used the tags on any of your tickets in Zendesk? 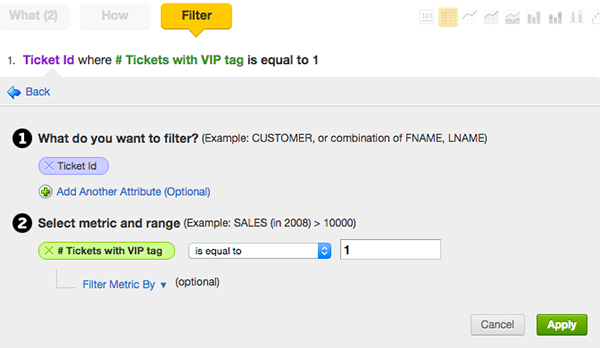 Insights populates tag data based on how tags are used in tickets. If a tag hasn't been applied to any tickets, Insights can't see it. Once you use the tag on a ticket, that ticket needs to sync to GoodData. On Professional plans, data syncs once per day. On Enterprise plans, it syncs every hour or so. Zendesk changes don't appear immediately in Insights, but they should show up after the next sync. Hi Amy - This is great. I was wondering if this could be modified to get the number of tickets for a specific tag but if no tag was present it would be defined as 0. I'm trying to see how many agents had a ticket with a specific tag for tickets they solved but if they did not have any tickets with that tag, then it would show the agent had 0 number of tickets. If you want to do it just visually in the reports simply add this to your existing metric formatting: "[=null]0"
"SELECT IFNULL(Your Metric Here, 0)"
That still has the limitation for me at least for my application as it was just a simple # Ticket metric that was just using the Filter to remove ticket that had two different tags. Even with the IFNULL statement, it would still never show the Agent Name being 0 because the tickets are filtered out. These are and example of the results with that setup for a team of five agents I getting basically. This can "trick" GoodData into treating the 0 as a real number, instead of a null value replacement. I tried this metric in a test account, and it showed me results very similar to your example. Please note, this trick only works when the report has one attribute under HOW. If you add more attributes, GoodData starts leaving cells blank again. Hi there! I was wondering if you could help me out on this one. I am currently trying to create a metric to measure the amount of tickets for VIP and Non-VIP catergories that were closed with a macros and custom reply. However for some reason the numbers on the custom tag vs the macro tag end up being the same. Since reporting with tags work only for specific metrics, how would I know if the metric that I want to create (or create) and break down using tags will give me the correct results or not? I am looking at average touches, Biz hrs 1st reply Avg time, Satisfaction %age, Reopen %age by tag for each customer segment. Hi Vijayendra! Tag data is connected through the TicketTagId attribute, which is linked to Ticket Id. If that attribute connection is not in the metric, the metric won't recognize ticket tags. You don't need to customize all your metrics to include tag data. That would take a lot of extra work, and there are a lot of places where it could go wrong. 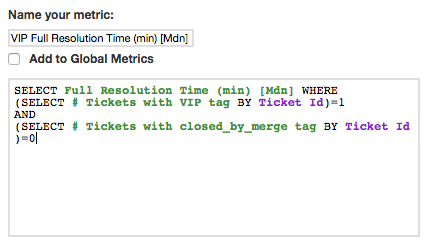 Instead, create tag filtering metrics using the # Tickets metric (which does connect to ticket tags), then use those metrics to filter your report. As long as you're reporting on tickets by ticket ID, the filtering metrics should work. I am trying to create a custom metric which basically connects #Unsatisfied with a particular Ticket Tag. They are not directly connected. I do not understand how I should connect them with Ticket TagID or Ticket ID. The default satisfaction metrics do not connect to ticket tags, so they will ignore Ticket Tag. Satisfaction data is pretty far from ticket tag data in the data model, so it would be very difficult to link them directly within one metric. 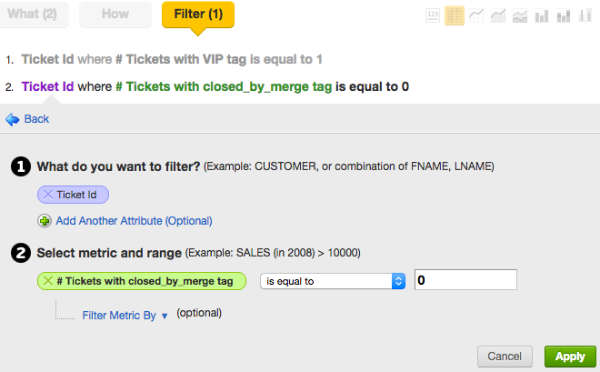 Instead, you'll need to create a tag filtering metric based on the # Tickets metric. # Tickets is connected to tag data, so it does respect tag filters. Once you have a tag filtering metric, you can use that whole metric to filter your satisfaction report. As long as everything is based on ticket data, it should work. There are examples and specific steps in the recipe section above. Hi Amy! I am trying to create a new metric. I have followed the instructions of this article but I get an error message. Please see the screenshot. Can you see what I have done wrong?